In many ways, contemporary American craft beer is constantly chasing extremes. Extreme hops, malt, and alcohol are the norm. Eisbock can be seen as one of the original ‘extreme’ beers. It predates the American craft beer movement, but is equally as intense and flavorful as some of the most coveted craft beers. Eisbock manages to maintain a smooth lager character while being a showcase for the intense malt flavors inherent to many of the great German malts.This recipe has done well in competition, winning a silver medal in the Bock category at the final round of the National Homebrewer Competition in 2015. The myth of eisbock is that it owes its origin to a brewer who inadvertently left a barrel of dopplebock outside in the winter which led to the freeze concentration of the nectar inside. True or not, the science is sound and methodology similar to what I used for this beer. Alcohol inherently freezes at a much lower temperature than water. This trait can be exploited by brewers, allowing them to effectively concentrate the alcohol in their beers while discarding some of the water content. When designing an Eisbock, my intent was to specifically formulate a base doppelbock that would be lean on caramel character in order to avoid a cloying sweetness once the flavors are intensified during freeze-concentration. Additionally, I wanted to keep the IBUs low as it is has been my experience that freezing a beer will concentrate the bittering compounds. The same logic can be applied to alcohol heat. Providing for a healthy fermentation is key to avoiding excessive fusel alcohols which will be concentrated in the final beer. My focus was on creating rich toasty notes with a solid Munich malt base while including a touch of high lovibond caramel to throw in a bit of dark fruit flavor that is delicious in these types of beers. 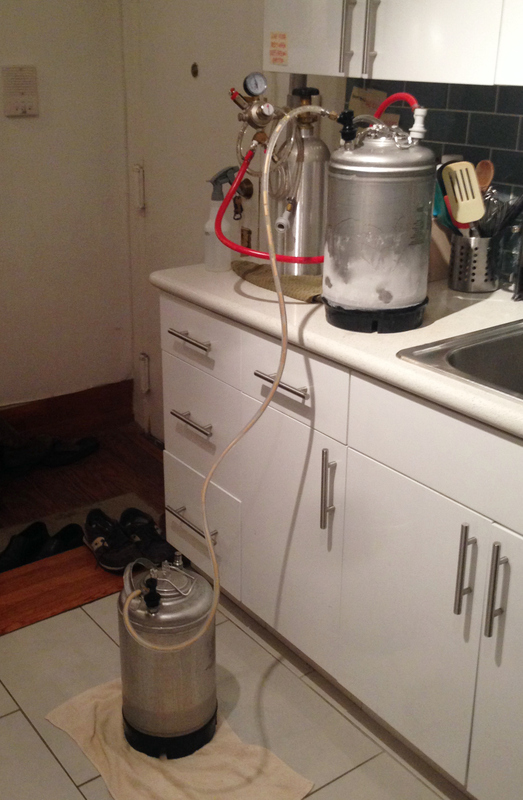 Utilizing C02 and a jumper line to transfer beer keg to keg during the freeze-concentration. The trick to doing this beer correctly is in the freeze-concentration. I went through approximately 8 freeze cycles utilizing two 3-gallon corny kegs and my kitchen freezer. 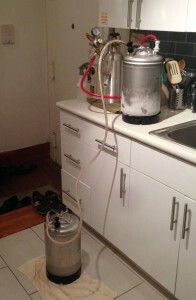 The basic methodology is to freeze a keg of the beer and then push out the remaining unfrozen liquid to a second keg. It is extremely important to use closed vessels purged with CO2 in order to minimize any risk of oxidizing the beer. Patience is key; multiple incremental freezes that only push a small volume of liquid at a time will help insure you’re pulling out the most concentrated liquid. In the end, I pulled out approximately 32% of the original volume. The liquid that was discarded typically had a specific gravity of near 1.000 meaning that it was primarily water. Sensory analysis of the discarded liquid confirms that it was primarily water. This freeze concentration effectively took my ABV from approximately 7.5% to over 11%. Decoctions used between each step. Rich and decadent malt fills your olfactory nerves. The malt is toasty and reminiscent of heavily browned bread crust. There is a background of rich dark caramel providing additional complexity. Enticing aromas of dark fruit, plum, fig, and perhaps cherry waft from the glass. As it warms, a bit of ethanol is apparent and true to the style. Deep brown with only the slightest of tan heads that quickly dissipates. Beer is nice and clear due to the prolonged lagering period. Huge display of rich malt. There is some residual sweetness that manages to be kept in balance by some intense toasty, almost drying, malt notes. The malt is wonderfully complex with a round nuttiness, followed by fig, molasses, burnt sugar, and sourdough toast. There is just a hint of hop bitterness and no flavor. Fermentation character is clean with a low level of hot alcohol. No ester or other fermentation character. Silky full-body with a smooth medium-low level of carbonation. Mouthfeel is just a touch sticky, but otherwise quite luscious. Beautiful showcase of the melanoiden-rich Munich malt that comprises the bulk of the grain bill. Rich and decadent, it would be tough to consume more than a bottle of this at a time. This Eisbock is a great sipper to spend some time with slowly consuming and contemplating the broad spectrum of flavors it contains. The beer would be absolutely delicious paired with a sharply acidic aged cheddar. 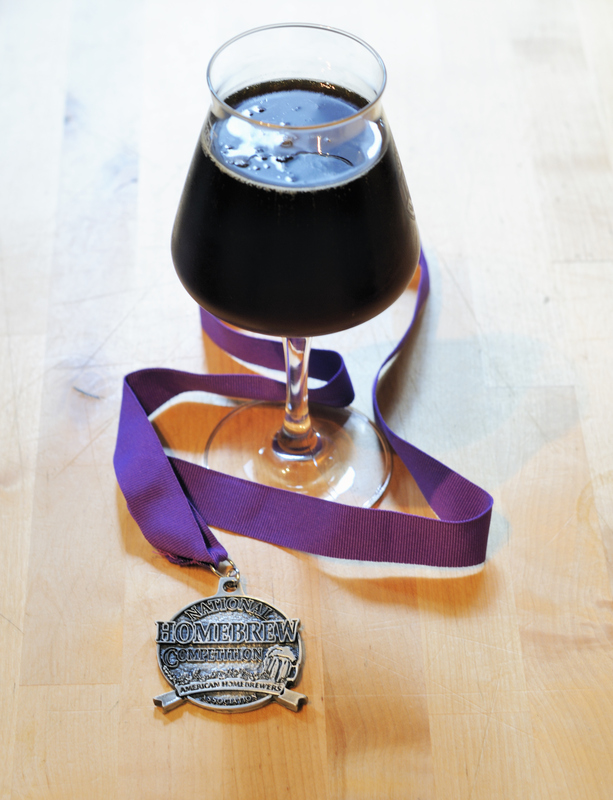 This entry was posted in Homebrew Recipes, Homebrew Tasting, Homebrewing and tagged beer, bock, eisbock, german beer, homebrew, homebrewing, lager, national homebrew competition, nhc, recipe, review by Nick Ladd. Bookmark the permalink.